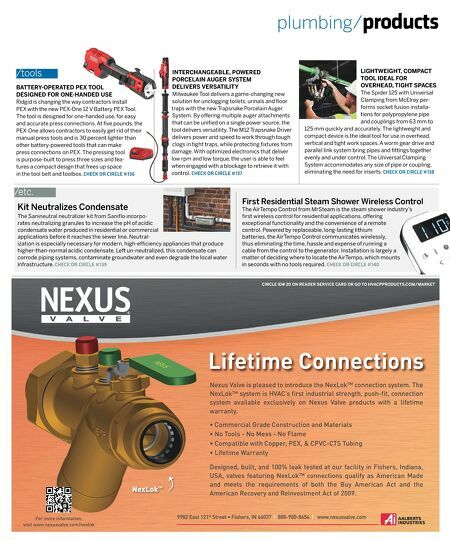 | | / t o o l s / e t c . Lifetime Connections Nexus Valve is pleased to introduce the NexLok™ connection system. The NexLok™ system is HVAC's first industrial strength, push-fit, connection system available exclusively on Nexus Valve products with a lifetime warranty. • Commercial Grade Construction and Materials • No Tools - No Mess - No Flame • Compatible with Copper, PEX, & CPVC-CTS Tubing • Lifetime Warranty 9982 East 121 st Street • Fishers, IN 46037 888-900-8654 www.nexusvalve.com NexLok ™ Designed, built, and 100% leak tested at our facility in Fishers, Indiana, USA, valves featuring NexLok™ connections qualify as American Made and meets the requirements of both the Buy American Act and the American Recovery and Reinvestment Act of 2009. For more information, visit www.nexusvalve.com/nexlok CIRCLE ID# 20 ON READER SERVICE CARD OR GO TO HVACPPRODUCTS.COM/MARKET BATTERY-OPERATED PEX TOOL DESIGNED FOR ONE-HANDED USE Ridgid is changing the way contractors install PEX with the new PEX-One 12 V Battery PEX Tool. The tool is designed for one-handed use, for easy and accurate press connections. At five pounds, the PEX-One allows contractors to easily get rid of their manual press tools and is 30 percent lighter than other battery-powered tools that can make press connections on PEX. The pressing tool is purpose-built to press three sizes and fea- tures a compact design that frees up space in the tool belt and toolbox. CHECK OR CIRCLE #136 LIGHTWEIGHT, COMPACT TOOL IDEAL FOR OVERHEAD, TIGHT SPACES The Spider 125 with Universal Clamping from McElroy per- forms socket fusion installa- tions for polypropylene pipe and couplings from 63 mm to 125 mm quickly and accurately. The lightweight and compact device is the ideal tool for use in overhead, vertical and tight work spaces. A worm gear drive and parallel link system bring pipes and fittings together evenly and under control. The Universal Clamping System accommodates any size of pipe or coupling, eliminating the need for inserts. CHECK OR CIRCLE #138 Kit Neutralizes Condensate The Sanineutral neutralizer kit from Saniflo incorpo- rates neutralizing granules to increase the pH of acidic condensate water produced in residential or commercial applications before it reaches the sewer line. 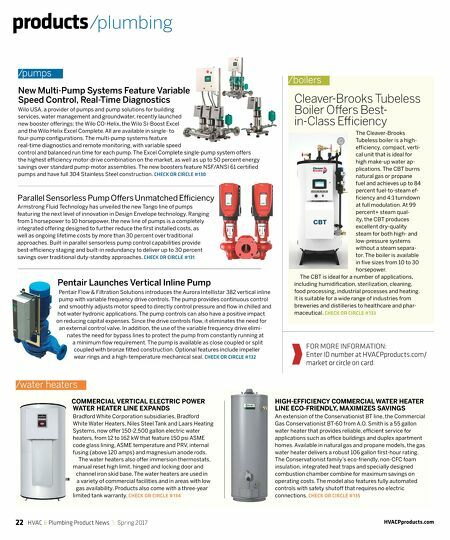 Neutral- ization is especially necessary for modern, high-efficiency appliances that produce higher-than-normal acidic condensate. Left un-neutralized, this condensate can corrode piping systems, contaminate groundwater and even degrade the local water infrastructure. CHECK OR CIRCLE #139 INTERCHANGEABLE, POWERED PORCELAIN AUGER SYSTEM DELIVERS VERSATILITY Milwaukee Tool delivers a game-changing new solution for unclogging toilets, urinals and floor traps with the new Trapsnake Porcelain Auger System. By offering multiple auger attachments that can be unified on a single power source, the tool delivers versatility. The M12 Trapsnake Driver delivers power and speed to work through tough clogs in tight traps, while protecting fixtures from damage. With optimized electronics that deliver low rpm and low torque, the user is able to feel when engaged with a blockage to retrieve it with control. CHECK OR CIRCLE #137 First Residential Steam Shower Wireless Control The AirTempo Control from MrSteam is the steam shower industry's first wireless control for residential applications, offering exceptional functionality and the convenience of a remote control. Powered by replaceable, long-lasting lithium batteries, the AirTempo Control communicates wirelessly, thus eliminating the time, hassle and expense of running a cable from the control to the generator. Installation is largely a matter of deciding where to locate the AirTempo, which mounts in seconds with no tools required. CHECK OR CIRCLE #140 plumbing/ products /tools /etc.